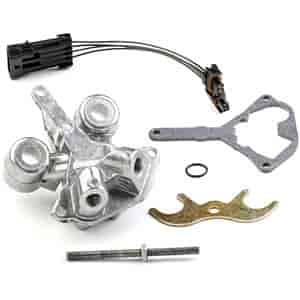 534-170 - Holley Pro-Jection TBI Replacement Parts is rated 4.0 out of 5 by 1. Rated 4 out of 5 by GMCSuperBeater from Needed tweeking The fuel return passages from the injector pods to the pressure regulator chamber needed to be cleaned up with a Dremel grinder at the entrance to the pressure regulator chamber. There was enough casting flash left over to block the passages at least 75%. Fuel pressure is now stable thru all engine speeds and blower pressures. There is still an "O"ring issue in the injector pods at the lower end of the injectors. I solved the problem by adding two thin "O" rings to seal the injector at the bottom and used the supplied "O"ring between the bottom injector filter and the pod body. The fuel drip into the throttle body is now gone and the engine runs amazing smooth and strong. What injectors are supposed to be used with this setup. Part number preferred too.